Bowen Island ended 2015 with 5 single detached home sales in December – the highest level year-over-year seen in 6 years and 1 better than December 2014. The table below puts those detached sales into perspective for the year. As you can see, total sales were up +35% versus 2014 while active listings headed in the opposite direction falling up to -50% or more over the course of the year. The median sale price on a month to month basis in the table above fails to reflect price trend due BI’s small volume of sales. 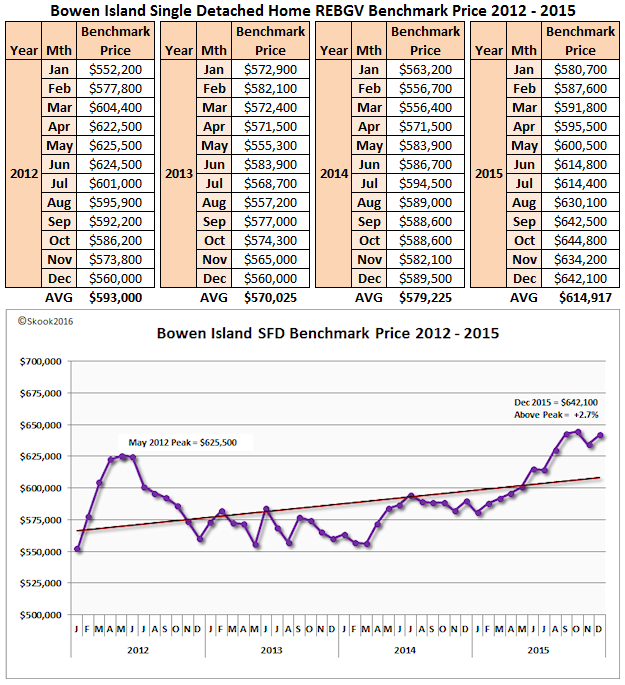 With rising sales and lower inventory, prices have to be rising and we can see that trend in the MLS® Benchmark price. BI passed the May 2012 Peak Benchmark ($625,500) in August 2015 ($630,100) and ended the year up +2.7% ($642,100). Now for those who followed my BI posts, you know that I was itching to see who would end the year with the most reported 2014 sales: Macdonald Realty or their associated BI Realtor® Dee Elliott. Macdonald Realty compared 2015 sales with 2014 sales each month in their Bowen Island 2015 Market Hot Sheet and Elliott had posted a 2014 year-end sales summary to her Facebook page back in January 2015. And, the winner is...drum roll please...Macdonald Realty!! 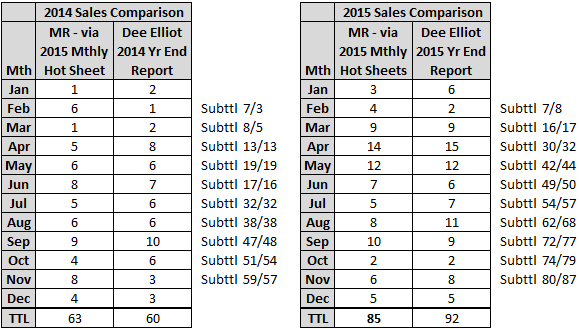 According to them, 2014 had 63 sales vs Elliott’s 60 reported sales (left table below). Oh but, Elliott makes them eat dust with her 2015 year-end summary. She reported a huge grin-inducing 92 sales versus her own brokerage firm’s year-end tally of 85 (reached by adding up the sales figure reported in their monthly Bowen Island 2015 Market Hot Sheet). A difference of 7 sales – go figure.